Review by AllTheBestFights.com: 2015-06-05, great fight between Davit Kiria and Sitthichai Sitsongpeenong: it gets three stars. The black belt in karate Davit Kiria entered this fight with a kickboxing record of 23-8-0 (12 knockouts) and he is ranked as the No.3 super welterweight in the world. He won the Glory Lw title last year, against Andy Ristie (=Ristie vs Kiria), but then he lost it at his first defense, with Robin van Roosmalen (=Kiria vs Roosmalen 3); after this bout he came back to win beating Zheng Zhaoyu. His opponent, the 2014 Lumpinee Ww champion Sitthichai Sitsongpeenong, has an official record of 97-28-5 and he entered as the No.5 welterweight. He has already fought four times in 2015 winning over Murthel Groenhart (=Groenhart vs Sittichai), Andy Souwer (=Souwer vs Sitthichai) and Crice Boussoukou but then he was defeated by Dylan Salvador (via split decision). 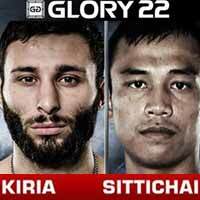 Kiria vs Sitthichai is the semifinal of Glory lightweight contender tournament; undercard of Rico Verhoeven vs Benjamin Adegbuyi – Glory 22. Watch the video and rate this fight!